The music ecosystem encompasses a large number of players: songwriters, performers, sound engineers, PROs, labels, streaming platforms, other service providers, and also private and business consumers. It is enormously challenging to achieve trust, simplicity and transparency of all transactions between these numerous participants in a complex landscape. Blockchain can help us meet this challenge. Indeed, achieving the triple win of trust, simplicity and transparency is the very nature and the goal of blockchain’s shared decentralised ledger. The way data is recorded and stored in the form of blocks of information and assets, and the way each block is virtually impossible to change after the record has been created, makes it easy to trace any given transaction in real time and ensures all data is reliably available to all members of the blockchain. Data on blockchains is stored on every node connected to the network. All the data is linked and verified at every block and so has no single point of failure - balancing security and central control with the convenience and opportunity of sharing data between organisations and individuals. This principle applies smoothly enough to copyright, licensing and rights management. Blockchain enables intellectual property tracking and helps the rightful owners as well as PROs and music publishers to track the usage of their composition or sound recording. In fact, music publishers and PROs, who have long struggled to build a single song database, should consider uniting their efforts in development of a distributed ledger rather than trying to manage a static database that is unequal to the task. Blockchain would allow publishers and PROs to provide better service to their members. Moreover, blockchain-based smart contracts can give music creators greater control over how their music is used and monetised, bringing transparency and mitigating royalty disputes with their publishers and distributors. Smart contracts are, in their simplest form, programs that execute certain functions of the contract itself and which are shared and validated collectively by its stakeholders. Smart contracts have been designed to automate transactions in a trusted way. In addition, they can be cryptographically secured, encrypting the transactions so that only the stakeholders can decrypt and execute them. Decentralised distribution of digital assets is likely to be especially appealing to independent artists looking to connect with fans and earn from direct sales without cuts to third parties. For instance, a few years ago, Imogen Heap collaborated with Ujo to deliver tracks directly to fans, accepting payments in cryptocurrency. The model later became a basis for Imogen Heap’s own startup - Mycelia. Larger distributors and streaming services would, in turn, make use of the technology to make various improvements – including to their information and asset flows, digital supply chains and reporting tools. We have no doubt that promising blockchain startups will soon be acquired by larger enterprises. This is already happening, as when earlier this year, Spotify acquired the team behind Mediachain Labs, a New York-based startup that specialises in blockchain. While some components of the music industry struggle to remain relevant in the age of streaming platforms, concerts have become the primary source of revenue for a majority of artists. This lucrative live industry will also experience disruptive influences of blockchain technology. Most importantly, blockchain-based “smart” paperless tickets provide a completely new level of security and fraud protection. Just as it allows tracking of other digital assets, the blockchain technology will track the ownership of a ticket, following its complete lifecycle in real-time. As a result, not only can venues and promoters fight the black market of scalpers and ticket touts, but they also get an opportunity to facilitate and effectively legitimise secondary ticket sales. Blockchain, thus, opens up additional revenue streams for venues and promoters and artists. And smart ticketing is not the only application of blockchain that benefits the live industry. Another potential application lies in safe streaming of live events and licensing new media, such VR concerts. Startups such as Zimrii Music, and the UK's Lava and Ujo are all working to capitalise on this potential. Yet another challenge where blockchain is relevant is the bringing together of venues and artists. Smaller venues and business owners struggle with inefficient manual booking process and having to purchase entire music catalogues when they only need a certain track. Secure micropayments and smart contracts will help automate the process and regulate the usage more effectively for all parties. A crowdsourced live music ecosystem Vibrate claims to do just that. Viberate has already created a directory of over 120,000 artists and a unique blockchain-based marketplace. They plan to soon add ticket sales to the platform, a digital currency called Vibes, and many other features. In the digital world of mobile devices, social media and streaming services, it often seems like we can listen to music anytime anywhere. However, some audio and video content is actually not globally available due to copyright and other legal restrictions. In certain other cases, a creative work may be suppressed by censorship in a particular country. 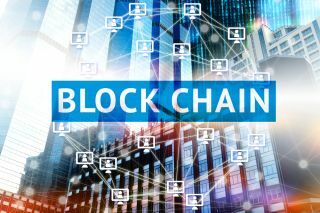 Blockchain may be able to open up new markets and revenue streams with automated rights management and global direct-to-consumer micropayments. To sum it up, blockchain holds a great potential to benefit virtually all sectors of the industry, disrupting current revenue and digital supply chain models. However, blockchain is not a panacea and it can only deliver on the promises of a more transparent and profitable music ecosystem to the extent that key players get onboard. At the end of the day, it’s a matter of finding an appropriate combination of proper implementation, supporting technologies, and user willingness to take advantage of the benefits that blockchain brings.